“Just one more game…” should be, arguably, one of the single most coveted phrases amongst app developers. I know it sounds silly to call such a thing “high praise”, but it represents the holy trinity of mobile gaming: fun, addictiveness, and replayability. These games aren’t necessarily the best looking or even the most interesting ones around, but they have the elusive X factor that keeps players coming back for more. Games like Plants Vs Zombies and Doodle Jump exemplify this rare combination, and now Ninjatown: Trees of Doom has emerged as a noble contender to these lofty giants of casual gaming. Wee Ninja must climb, jump, fling, and rocket his way ever higher between the Trees of Doom. This means also avoiding treacherously slick bark, ominously bubbling ooze, and numerous cranky demons who would like nothing better than to knock Wee Ninja all the way back down to the ground. There are also plenty of power-ups along the way, including the fantastically surreal flying Mucho Macho Mustachios. Thanks to Doodle Jump, never-ending jump games are a dime a dozen at the App Store, but very few have the slick, graphic appeal of Shawnimals behind them. Although the game is totally different from the Nintendo DS Ninjatown, Ninjatown: Trees of Doom packs the same bold and colorful design punch. Not everyone will be in love with the cartoon style, but it’s hard to deny the immediate visual impact. In addition to style, the game also has considerable substance, thanks to Venan Entertainment of Space Miner fame. The controls are trivially easy to learn, effectively just a tap for everything, but they are buttery smooth and intuitive, despite a wide variety of actions. Perhaps best of all, obstacles are randomly generated every game, so it always feels like a fresh challenge. Once you get used to the various types of enemies and obstacles, you definitely start to fall into the familiar rhythms inherent to all jump games, but Ninjatown is like a jazz riff on an old standard. They haven’t reinvented the wheel, but the developers have definitely done an exceptional job of turning out a supremely polished, cohesive and wholly kid-friendly game. If you liked Doodle Jump or Bird Strike, this is one you will almost certainly play again and again and again. Just don’t come crying to me once you realize Ninjatown: Trees of Doom has completely devoured all of your spare time. 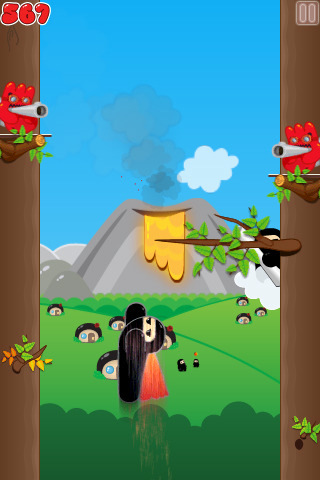 AppSafari review of Ninjatown: Trees of Doom was written by Tracy Yonemoto on May 21st, 2010 and categorized under Action, App Store, Featured, Fun, Games. Page viewed 3591 times, 2 so far today. Need help on using these apps? Please read the Help Page.